On Tuesday the pair GBP/USD has slightly grown due to technical correction. However, the USD is still supported by the data on the US GDP, which has grown by 5% versus expectations of 4.3%. Volatility is not expected to be high this week; however, the data on business activity in the manufacturing sector of the UK, which is scheduled for the release on Friday, can trigger the rise in the British currency. Little spike to the upside earlier today in EUR/USD, but i still favour my count that suggest that there's still a little more dollar strength to come. If the bottom has reached for EUR/USD, i would need to see clear 5 waves up in 4H chart before calling this the bottom. 1.208 looks tempting and i will look EUR/USD to reach that mark. Has EUR/USD found it's bottom? Not yet on my opinion. I think there's still a bit more to go before this half year downtrend has exhausted. EUR/USD moving sideways today with healthy volatility. I think this is now wave 4 before final downward push to maybe 1.208. At about 1.208 wave 5 would be 1.618 x wave 1. This would then conclude larger 5 waves down from 1.3993 (june high) and would mark the start of larger corrective move. This correction should find support around 1.30. I have forecasted EUR/USD on a different timeframes on my website http://vivaico.com but wanted to speculate a little further. As my readers will know i have projected possible moves for this Forex pair on weekly and monthly charts for months or even years to the future but now i wanted to also speculate on the reasons for these moves. The pair GBP/USD continues to move in the downward channel. Yesterday the pair tested new support level of 1.5485. At the same time, the American currency is growing versus the major currencies due to the growth of the US GDP in Q3. This index has grown up to 5%, which exceeded all expectations. The British pound substantially consolidated against the American currency yesterday. Backed by the UK positive retail sales statistics, the pound grew by over 100 points during the trading session. According to the published information, retail sales grew by 6,4% in November. Investors responded to the news by actively buying the currency. Let’s look at the four-hour chart. Tenkan-sen line is below Kijun-sen, red line is directed downwards while the blue one remains horizontal. Chinkou Span line is below the price chart; current Kumo-cloud is descending. 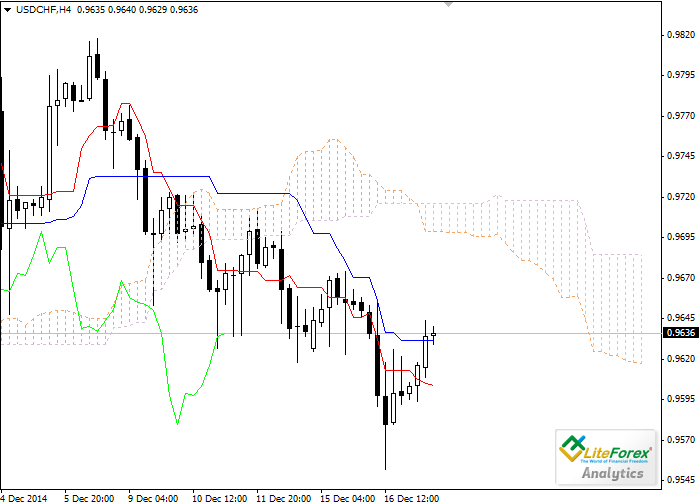 The pair has been corrected above Kijun-sen line (0.9631) and lower border of the cloud becomes the next resistance level at 0.9700. The NZD/USD continues to be trading within the wide downward channel. The quotes are correcting today: they tested the level of 0.7775 (the middle line of Bollinger bands) but did not manage to consolidate above. A downtrend is very likely to resume soon. European currency is traded near important resistance level of 1.2435, which is also a moving average with the period 200. 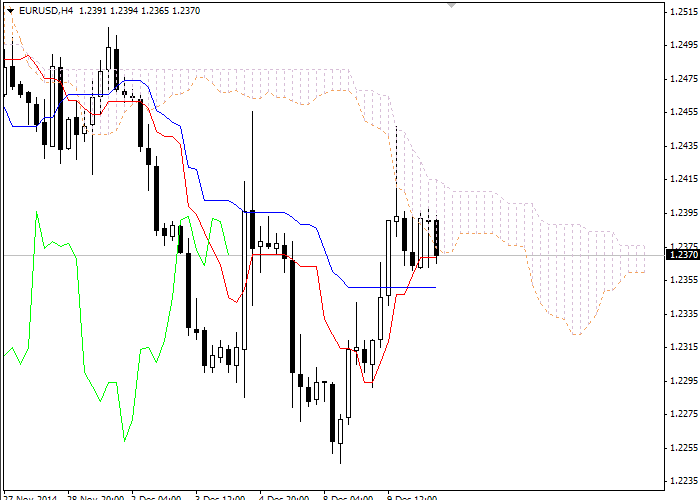 If Euro fails to consolidate above this level, the pair can reach the level of 1.2350. Euro is under pressure from the decision of the rating agency Fitch to downgrade rating of France by two notches up to the level of AA. At the beginning of the last week the USD had considerably weakened against the major currencies; however favourable US labor market data provided support to the American currency. Nonfarm payroll has exceeded the forecast and the pair GBP/USD fell to the key support level and the local lows of 1.5600. Last week trading session closed at the level of 1.5570.